Mayacamas is one of the older vineyard sites in Napa Valley. It was first cultivated in 1889 by John Henry Fisher. John Fisher was responsible for building the original, stone winery. In those early days, the vineyard was planted to a filed blend that included Zinfandel, one of the more popular grapes at the time. The vineyard died out by 1916, and eventually became fallow. The property was sold to Jack Taylor and Mary Taylor in 1941, who replanted the vineyard. In 1968, the Taylor family sold Mayacamas to Bob Travers and Elinor Travers. Robert Travers did not come from a winemaking background. He learned the trade from Joe Heitz, of Heitz vineyards. Perhaps, due to the influence of Joseph Heitz, Bob Travers began planting Cabernet. Under the direction of Bob Travers, Mayacamas Vineyards produced sublime examples of classic, Cabernet Sauvignon. Few people know, but some of the best wines ever produced at Mayacamas were made without the use of new oak, or modern, fermentation tanks. Many of their best wines were vinified in large, redwood vats! 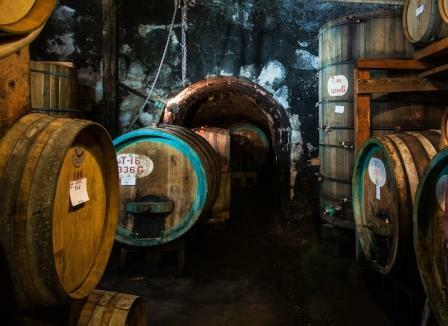 The wines were aged in barrels that could be more than 50 years old. By the time the Travers family sold Mayacamas Vineyards, the cellars were dilapidated and the vineyards needed replanting. In 2013, Charles Banks. a previous, co-owner of Screaming Eagle purchased the Mayacamas Vineyards from Bob Travers. Bob Travers has been the owner of Mayacamas Vineyards since 1968. One of the first moves Charles Banks did was to bring in Andy Erickson as the winemaker. He also hired Annie Favia to manage the vineyards. Charles Banks knew Andy Erickson since their days together at Screaming Eagle, so it was a natural fit. In September, 2016, Charles Banks was arrested on fraud charges that emanated from a civil law suit with Tim Duncan, of the San Antonio Spurs. Charles Banks was found guilty and sentenced to 4 years in prison on the fraud charges and in 2017, was forced to sell his shares in Mayacamas to his partners in the vineyard. The Mayacamas Vineyards property is a whopping 475 acres. But only 50 acres are cultivated with vines. The vineyard has various elevations ranging from 1,800 to 2,400. The Mayacamas Vineyards are located not far from Sonoma, at the peak of Mt. Veeder. Perhaps their best parcels are planted in the portion of the vineyards known as the Amphitheater Block. Mayacamas Vineyards is famous for their classic, mountain fruit, style of Cabernet Sauvignon. This is their flagship wine. The wine is made from 100% Cabernet Sauvignon. The property also produces a Chardonnay, “Terraces,” which takes its name from their steep, terraced, hillside vineyard and additionally, they also produce their version of a Bordeaux Right Bank look alike wine wine made from 100% Merlot grapes. Mayacamas wines are best served at 15.5 degrees Celsius, 60 degrees Fahrenheit. The cool, almost cellar temperature gives the wine more freshness and lift. Young vintages of their red wine can be decanted for 1-3 hours, depending on the character of the vintage. This allows the wine to soften and open its perfume. Older vintages might need very little decanting, just enough to remove the sediment. Mayacamas is best served with all types of classic meat dishes, veal, pork, beef, lamb, duck, game, roast chicken, ribs, hamburgers, barbecue, roasted, braised, grilled dishes and stews. Mayacamas is also good with Asian dishes, hearty fish courses like tuna, salmon, mushrooms and pasta. The white wine of Mayacamas is best served with all types of seafood and shellfish, sushi, sashimi, chicken, veal, pork and cheese. Tart, bright, crisp and acidic, the medium bodied wine felt hard. Better on the nose than the palate, with its red fruits, I know some people will like this a lot more than I did. It's just not much fun to drink. It's too bad Mayacamas does not make wine like they used to. Their Cabernet Sauvignon from the 70's is still going strong today. Sadly, this lighter style of wine offers tart cranberry, spice and cherry, medium body and a tart, rustic finish. Some tasters will like this more than I did. It's not my style of wine. Much more interesting on its tobacco, earth, spice, cassis and cranbery nose than on its shrill, faded, tart, red berry finish. Hanging on to life by a very, very thin thread, you could sense a bit of lemon buried in the petrol nose and finish to make it interesting to taste a California Chardonnay at close to 40 years of age. Tart red fruit and earthy scents in the nose. Rustic in personality, the fruit is fading and leaves you a tart, cranberry, drying sensation in the finish. Drink up. Deep gold in color, with a tart, orange character, to say this was past its prime would be polite. On the bright side, it was wet, had alcohol and a tiny bit of orange fruit remaining. A good ringer for a fading 1970's Bordeaux wine in a blind tasting due to its earth, tobacco, cedar and cranberry, cherry nose. Medium bodied, slightly tart in its red fruit finish, this requires drinking. Stern, tart, yet, lively, fresh, aromatic, and popping with a cornucopia of herbs, red fruits, forest floor and tobacco scents. Full bodied, reserved, but with a strict, finesse bearing, it's hard to see this getting better, but I said that about 10 years ago too! The best bottle of this wine I recall tasting. The wine had a sweet and tart cherry quality, that paired perfectly with the earth, tobacco and thyme notes. Full bodied, slightly rustic, but still utterly charming, this was quite nice and a perfect example of what classic California Cabernet Sauvignon is all about. This particular bottle of 1974 Mayamas was disappointing. I've tasted, better, fresher, cleaner examples. My bet is, it was the specific bottle and not the wine. The color made it seem like the wine was at least 10-15 years younger. The nose offered tobacco, earth, blackberry, cassis and cedar. But the palate was marred by some bitter flavors, rusticity in the tannins and a bit too much acidity in the finish. The fill was pristine, but after close to 40 years, it's all about the bottle. Fortunately, or unfortunately, I have a few more to try. Smoke, caramel, earth, licorice, spice, cassis and mocha aromatics are in abundance. This concentrated old school Cabernet, wine feels a little rustic in mouth and ends with cassis and rhubarb flavors that express some tart qualities. Not quite dead, which is saying a lot for a 40 year old bottle of California Chardonnay. If you prefer notes of petrol, mixed in with your honeysuckle and a tart finish, you'll probably like this more than I did. Great aromatics. Some cherry tinged fruit in the short finish. The wine declined in the glass after 10/20 minutes. It is difficult to believe that not only is this more than 50 years of age, released the year Hendrix produced "Electric Ladyland", but the wine is stunning! One of the best older, classic California wines I have ever tasted, this is dense, full bodied, and loaded with ripe cherries, pipe tobacco, cigar box, herbs, wet earth and smoke. The wine has body, depth, complexity and character that shine from start to finish. This deserves to be talked about as one of the top, older California wines ever made!